Fashion Theory, a premier journal in the academic study of fashion, seeks articles for a special issue on Brazilian Fashion. The issue will be guest edited by Dr. Rita M. Andrade (Universidade Federal de Goiás, Brazil) and Dr. Regina A. Root (The College of William and Mary, USA). 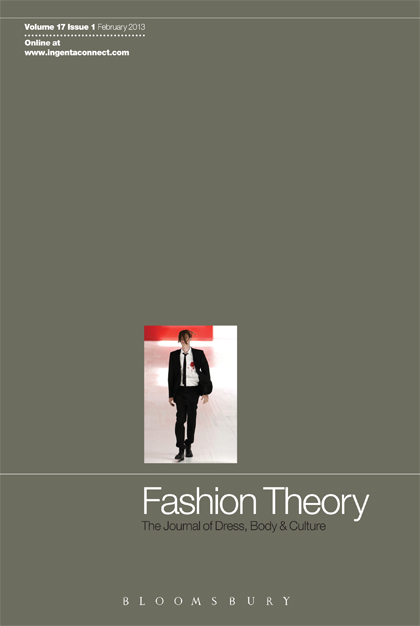 “Fashion Theory takes as its starting point a definition of ‘fashion’ as the cultural construction of the embodied identity. The importance of studying the body as a site for the deployment of discourses has been well established in a number of disciplines. Until Fashion Theory’s launch in 1997 the dressed body had suffered from a lack of critical analysis. Increasingly scholars have recognized the cultural significance of self-fashioning, including not only clothing but also such body alterations as tattooing and piercing. Deadline for abstract submission (300 words): August 1st, 2014; act fast! This entry was posted in Call for Papers, EDUCATION, Responsibility on July 15, 2014 by Nadira Lamrad. I recently ran into Dr. Anne Peirson-Smith at an event and she mentioned that City University of Hong Kong (which happens to be where I’m completing my PhD) is hosting the Fashion in Fiction 2014 conference with the theme Style Stories and Transglobal Narratives. The conference will take place at CityU in Hong Kong from June 12-14, 2014 hosted by the Department of English and the Run Run Shaw Creative Media Centre. Click below to see the very detailed call for papers. Submitted conference papers will be blind peer-reviewed and conference organizers aim to publish accepted submissions either as a journal article or as a book chapter. Abstract Deadline: February 1, 2014. Acceptance Notification: February 14, 2014. This entry was posted in Call for Papers, Conferences, Education, EDUCATION, Responsibility and tagged Call for Papers, CFP, City University of Hong Kong, conference papers, Fashion in Fiction 2014, Fashion in Fiction conference, style stories, transglobal narratives on January 14, 2014 by Nadira Lamrad. Fashion, Style & Popular Culture seeks academic articles for a Special Issue entitled Latin American / Latino Fashion, Style and Popular Culture. “Fashion, Style & Popular Culture is concerned with style, fashion, clothing, design, and related trends, as well as appearances and consumption as they relate to popular culture. Scholarship using and/or including: historical, manufacturing, aesthetics, marketing, branding, merchandising, retailing, psychological/ sociological aspects of dress, body image, and cultural identities, in addition to any areas topics such as purchasing, shopping, and the ways in which consumers construct identities are welcome. Deadline for submission: February 1st, 2014; act fast! This entry was posted in Call for Papers, Education, EDUCATION, Responsibility and tagged academic writing, Call for Papers, CFP, Fashion Style & Popular Culture, Latin America, Latin American Fashion on January 14, 2014 by Nadira Lamrad. Click through for the details, and to meet the editors. Good luck with your research! This entry was posted in Call for Papers, Cultural, Environment, Environmental, Events, HIDDEN NARRATIVES, Labour, Political, Responsibility, Social and tagged Call for Papers, fashion, natuarl dye, natural colourants, Research Journal of Textile and Apparel, Sustainable Design, textile on August 3, 2011 by Mary Hanlon.